The high pressure pump sector is the one from which the entire Group originated. In accordance with its overall philosophy, Interpump introduced a radical innovation in this field that has since become the new benchmark and has made it the worldwide leader in the high pressure pump market. The pumps designed and built by Interpump are more compact, manageable and silent, configured to facilitate the replacement of spare parts. 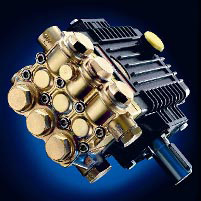 But the truly unique and revolutionary Interpump breakthrough was the use of ceramic pistons which, compared to those in steel, have increased pump life and reliability. Today, the full product range includes high pressure pumps (up to 500 bar) manufactured by Interpump and ultra-high pressure pumps (up to 1500 bar) made by the Pratissoli Pompe division. All pump components are constructed of the highest quality materials that are systematically checked and tested at every production stage. Assembly is performed with maximum precision so that the finished product will withstand the heavy wear-and-tear of industrial usage. 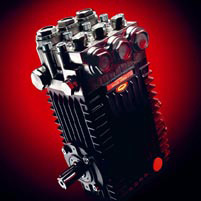 The ultra-high pressure sector began within the Group from the experience of Pratissoli Pompe, nowadays among the worldwide market leaders for its comprehensive range of pumps and accessories supplied in any industry: iron and steel, chemical and petrochemical, building, water treatment, just to mention a few. The range of triplex pumps, developed in more than 50 years of activity in the field, counts over 60 different models including flow rates up to 420 liters per minute, pressures up to 1500 bar, powers up to 150 HP, all models designed and produced to stand the toughest working conditions. The Water Jetting sector has been strengthened by our acquisition of Hammelmann Maschinenfabrik GmbHand NLB CORP.
HAMMELMANN is internationally renowned as worldwide leader in ultra-high pressure fluid pumping technology. It was founded in 1949 in Oelde, Germany, and became part of the Group in 2005. The company owns sales branches in Spain, Usa, China and Australia. 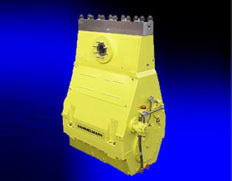 Hammelmann manufactures high and ultra high pressure pumps, with input power up to 750 kW and working pressure up to 4000 bar. 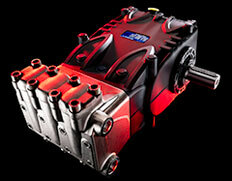 It is also specialized in supplying complete "tailor-made" ultra-high pressure systems. Its producs are used in a variety of applications, such as cleaning of surfaces, pipes and tanks, "cold" cutting of hard materials, coating removal, etc. The company is also gaining market shares in the segment of process pumps, which are used in various industries, such as pharmaceutical, cosmetic, chemical, petrochemical, food, etc. 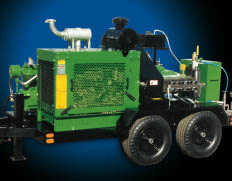 NLB CORP. , founded in 1971, is one of the major manufacturers of high pressure water jetting machines in the world. This success is due to the capability to anticipate the specific cleaning requirements coming from the industry and specialized cleaning contractors, as also by a strong design competence in the field of pumps and accessories with highest quality level. NLB CORP. is specialized in manufacturing standard and customized units, with both electric and diesel drive, mounted on skids or trailers to facilitate transportation. 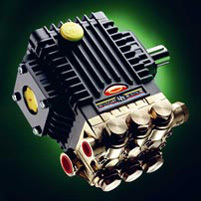 The range of models offers a wide choice: from 2000 to 14000 p.s.i. (140 to 2800 bar). The pumps manufactured by NLB CORP. are renowned for their robustness and efficiency, as well as for their high reliability.